We thank all our clients for the interest in Anta Agni performances, professional collaboration but also many personal experiences and friendships. Our work gives us freedom, space for being creative, possibility to travel to all corners of the world, get to know various people, cultures and life philosophies. In addition to all this, most of all it fills us with satisfaction when our performances meet with a good response, applause or joy of our audience and clients. Of the positive references over the recent period, we select a few that give us a sense of good work and desire to continue in our creativity. From the start the cooperation was easy and quick. 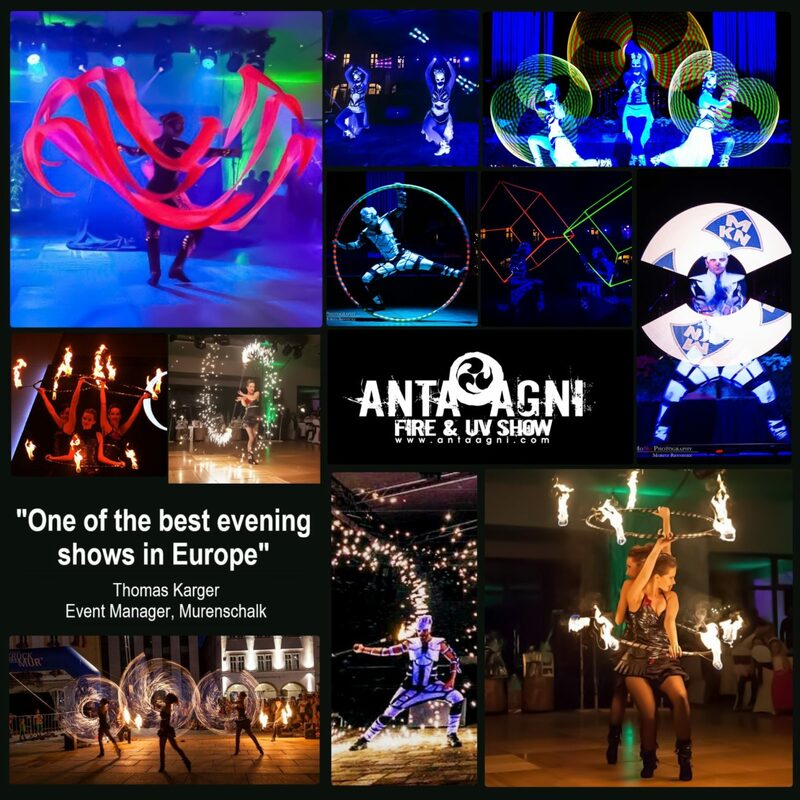 Their performers are professional individuals, who create an amazing atmosphere with both the Fire Show and the beautiful UV Show. Anta Agni is definitely a great addition to any event. Head of Artist Management & Bookings Dept. Anta Agni is for me one of the best evening shows in Europe. In addition to the fire show, not only me, also the LED show. Smoothness is provided by the program. Not only perfect performance but also organization, Contract fulfillment are to be highlighted. Thanks to Anta Agni for wonderful hours. Anta Agni’s performance was amazing and highly professional. Individual performances were used as dividing lines between the sections of the programme and the audience was left breathless. Finally, it should be noted that communication before the show was absolutely smooth and professional in every aspect. Therefore I highly recommend Anta Agni if you want to offer your audience something more. The group Anta Agni has enriched our organized events for several years already. Choosing them is not only a guarantee of satisfaction but especially creativity, style and precision. They will enrich every event and create an emotional experience for the quests. We highly recommend.